Between Scooter our office security guard, Tiaq our betta fish, and all the weekly animal-related social posts, it’s clear: OOHligans love our pets. 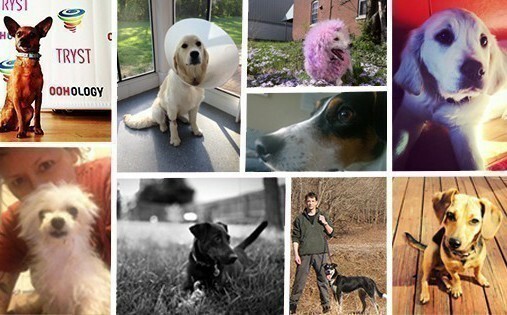 Our beloved furry coworkers and family members make OOHology a brighter place. In fact our passion for pets is so well-known, I often get emails just to see how Scooter is doing! It doesn’t just stop at the office, though. Many of us have adopted animals from local humane societies and volunteer our time to benefit these rescues. With all this animal magnetism in the office, it just made sense to take things a step further. This week OOHology extended its employee benefits to include an adoption program with the Kentucky Humane Society! OOHology will sponsor the adoption of any pet by our employees from the Kentucky Humane Society. This is just another way we can help out our favorite companions in the community, and also promote the adoption of animals from local rescues. Personally, I think this will be the best employee perk we have. Since today is National Adopt a Shelter Pet Day, we encourage everyone to consider fostering or adopting a pet from your local humane society or shelter. And the next time Human Resources asks “What new benefits should we offer?” consider suggesting pet adoption sponsorship. Pets add so much to our lives, and every pet deserves a loving home. We can’t wait to add to our growing animal family!